College Football, here in the South is a religion. The SEC, Southeastern Conference is made up of 14 of the best teams in this whole US of A. Depending on which state you live in, what school you are closest to, what family affiliation, where you attended or who you admire the most, being a Fan of one of the SEC teams starts when you are a toddler and never, ever goes away! The SEC is a NCAA Division 1-A class and was established in December of 1932. Now back when it started there were 13 teams from that 13 10 of the original remain. University of Alabama (Crimson Tide) 1831, University of Florida (Gators) 1853, University of Georgia (Bulldogs) 1785, University of Kentucky (Wildcats) 1865, University of Mississippi (Rebels) 1848, University of Tennessee (Volunteers) 1794, Auburn University (Tigers) 1856, Louisiana University (Tigers) 1860, Mississippi State University (Bulldogs) 1878 and Vanderbilt University (Commodores) 1873. I grew up here in the panhandle of Florida and friends and family are so diverse in who there favorite team is, it can and has divided friendships and family! The RIVALRIES are bar none some of the greatest grudge matches you have ever seen! This is what makes the SEC the greatest! Here is a list of the BEST: Alabama vs Auburn (Iron Bowl), Alabama vs Tennessee (3rd Saturday in October), Arkansas vs Louisiana State University (Battle of the Golden Boot), Auburn vs Georgia (Deep South Oldest Rival) Florida vs Georgia (World’s Largest Outdoor Cocktail Party), and Mississippi State vs University of Mississippi (Egg Bowl). Did you see that Alabama is on the list twice? YEP, Bama, The Thin Red Line, Crimson Tide, Roll Tide Roll! Even the song, Yea Alabama ends: So roll on to victory, Hit your stride, You’re Dixie’s football pride, Crimson Tide, Roll Tide, Roll Tide!! And least we ever forget Paul (Bear) Bryant the GREATEST college football coach to ever live. Ok y’all, I am a Alabama FANATIC. You can have your Big 10, Big 12, ACC, or so on, give me the SEC! Don’t get me wrong we follow all college football mainly to see who we will play in division playoffs. 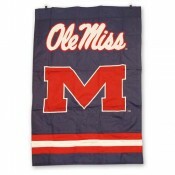 Here at United States Flag Store we carry the whole line of College Flags, Banners and Car Flags. College Football season started over the weekend so get your Pride on and fly your favorite colors, be they Crimson and White, Black and Red, Blue and Orange or Blue and Red. Oh by the way Bama beat West Virginia on Saturday! Editor’s note: hailing from, and living in, Pittsburgh, this article seems heretical to me. However, as they are ACC vs. SEC, I will leave this post in its entirety, with a disclaimer: the views and opinions of the above writer do not necessary reflect the opinions of this blog. 🙂 Go, Pitt Panthers!